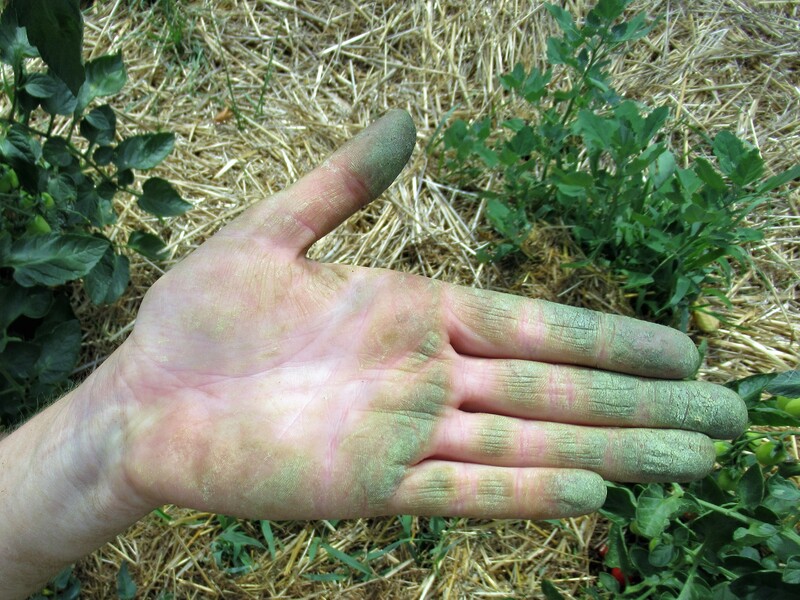 Tomato hands is what we call them! 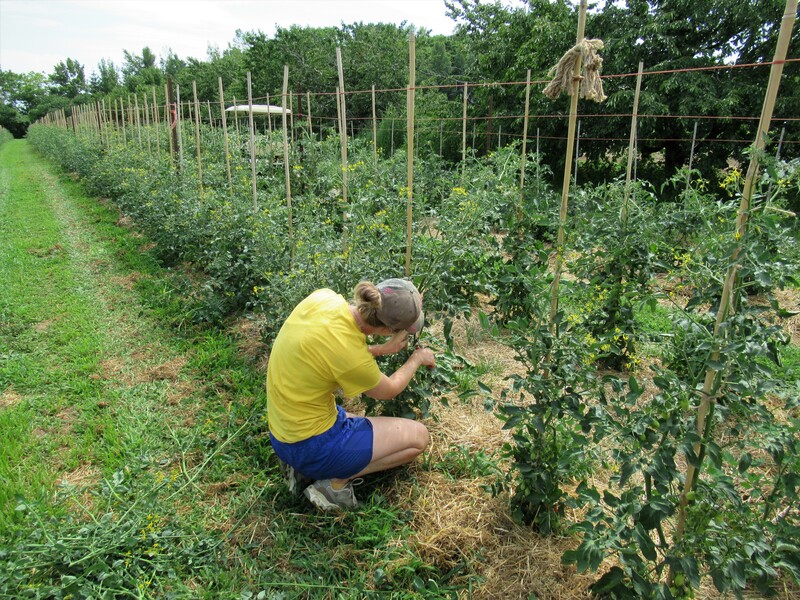 Pruning tomatoes – or suckering as we call it – is the big job on the farm right now. 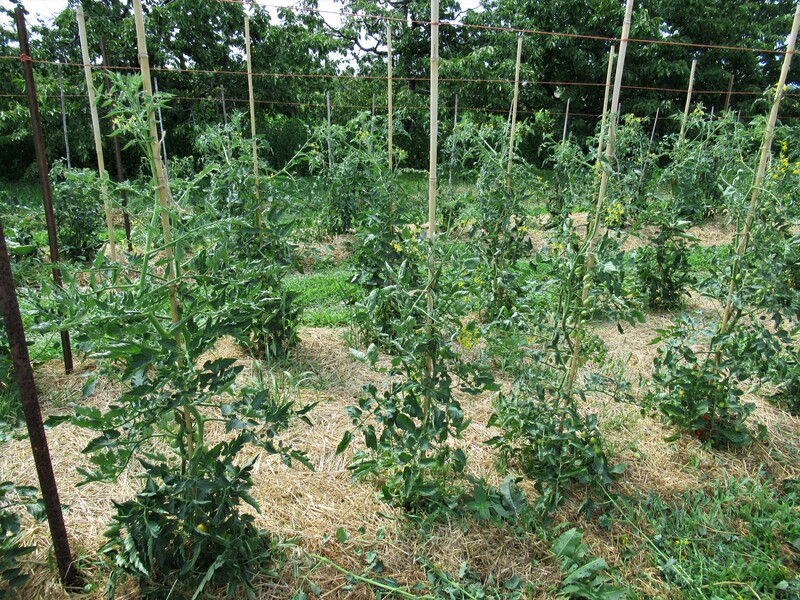 We prefer to stake all our tomatoes, tying them to bamboo poles. Then we prune them, snapping out the suckers or shoots that grow from the joint of the main stem and the branches of the tomato plant. If we left these suckers, they would grow into branches with lots of leaves and eventually more fruit. Removing them leaves the tomato plant a little more tidy & less bushy. It allows air to move freely through the plant reducing the risk of disease. The tomatoes will grow & ripen faster and be larger as the plant is putting its energy into this fruit rather than growing more foliage. They will not be blocked from receiving the sunlight from lots of extra branches, so the fruit will be more colourful & sweeter. 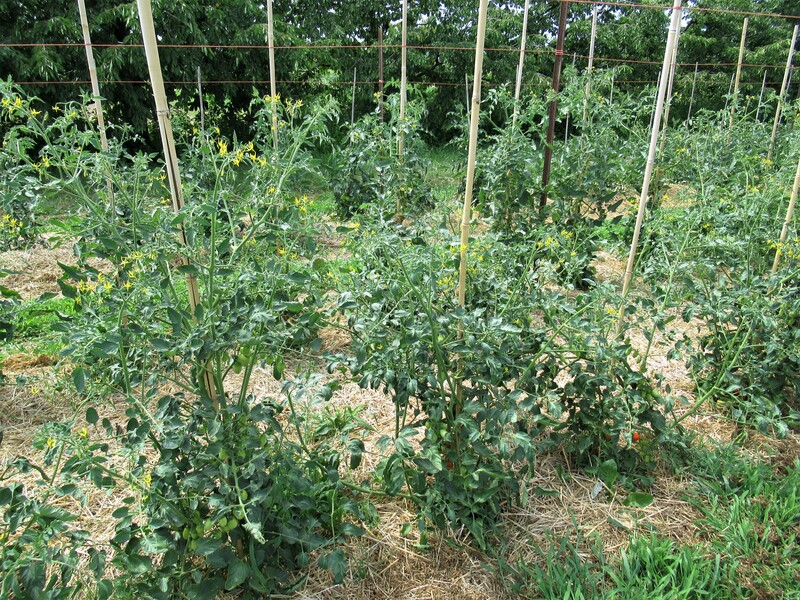 We feel suckering & tying the tomato plants gives us superior fruit & is worth the added work. And it is a lot of work! It has to be done again & again … every week is ideal. In a perfect world we would keep up, but all the other jobs on the farm still have to be done and so we fall behind. Then it is major surgery to remove the suckers & tie up the twisted, falling stems – challenging & slow work, but satisfying when completed. Of course letting the suckers get so big & then cutting them off is hard on the plant too. We usually try to keep the plants tidy & trimmed & tied until they grow to the top of the bamboo poles. By then we’re busy harvesting – and sick & tired of suckering & tying – so we let them go wild and be free! Tomato plants overdue for suckering & tying. 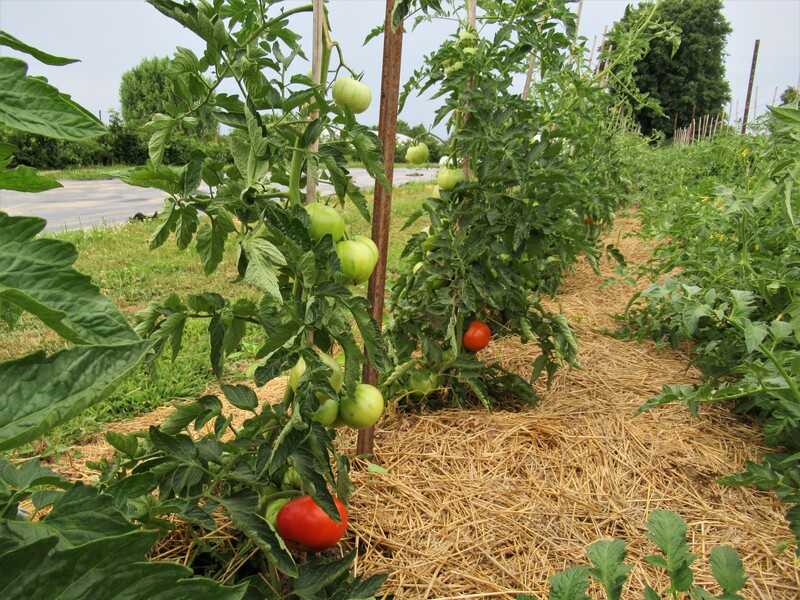 We usually leave 2 main stems on each tomato plant – sort of a compromise between pruning to get earlier, bigger fruit and getting more fruit from each plant. It works for us! Our large beefsteak tomatoes – yes, they are turning colour! As usual we got some suckered & tied, while some will be left to sprawl over the ground. At least they are easier to pick than the cherry tomatoes! Tomatoes, raspberries, new garlic, lettuce, arugula, zucchini, green onions. The first tomatoes will be in your share this week – perhaps cherry tomatoes, or medium/salad size, or even a large juicy beefsteak tomato. We probably won’t have a big harvest, but it will be a taste of what’s to come! We don’t have a lot of raspberry canes left on the farm, and even the new rows we planted this past year have disease and are doing poorly. That’s why we never even included raspberries in our list of possible crops you could expect in your CSA box this season. But there are some this week – a nice surprise! Enjoy a fresh bulb of new garlic. Because it is just pulled and not dried, it should be kept someplace with good air circulation, and out of the sun. Do not put in plastic or in the fridge. Once the bulb has been started, try to finish using it within a few days. We have been watering our next planting of lettuce to try to encourage it to grow! Now it’s ready! Enjoy a fresh salad again this week – perhaps with some spicy arugula to liven it up. Arugula is one of our most popular crops at our farmers’ markets. People absolutely love it! Some eat it alone as a salad (with strawberries, feta cheese & a drizzle of balsamic vinaigrette) while others mix it with lettuce or other greens. It’s also great in sandwiches. Zucchini & green onions will be in your box again this week. Green beans are a maybe for this week. The dry conditions are causing the first planting to yield less and the next planting to grow slowly. We’ll see what we are able to pick. Garlic scapes will be available as an extra for those who want some. Please remember to return all containers, so they can be reused!